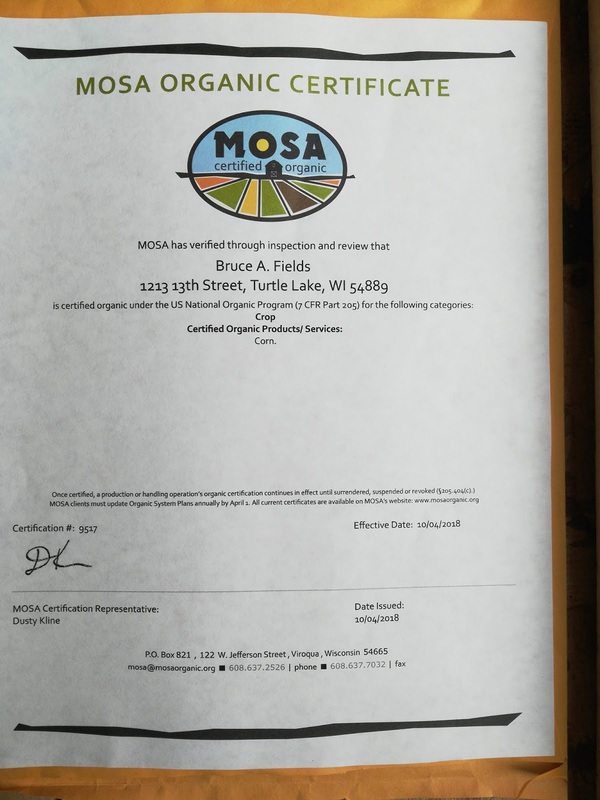 Grass Creek Farm: It's Official - We're "Organic"
It's Official - We're "Organic"
My certifying agency is MOSA. It's taken three years, but the first 61 acres is certified. All in all, a fairly smooth process. To give you some idea of what's involved, I have a notebook detailing every bit of work I've done on that parcel for the past three years. An independent inspector needed to see all the receipts for the inputs used on the land, which she looked at during a six hour on farm inspection. I paid about $1100 for this. This certification is important for the farm, as the only way to sell an "organic" product to another (certified) organic producer is to have your product officially certified. In our case this means that with every semi-truckload of organic grain that we sell, and it looks like there will be about nine full loads coming off this 61 acres, we need to provide the buyer with our Certification Number. This, in turn, allows for an auditable trail, enabling every input for a certified organic product to be verified as following organic practices in its production. "My Partner in Organic Success"
The rapidly growing organic market is a great opportunity for farmers, food processors, handlers, restaurants, and food retailers. Consumers are demanding, and are willing to pay a premium for, food and fiber produced in accordance with the USDA National Organic Standards. To access this market, you will need a knowledgeable and professional certification partner. As a USDA accredited certification agency with over 17 years of experience, MOSA is ready to serve your needs. Next year, based on our experience we're going to transition another 110 acres, spread across 3 different fields.